Gay Black Racist Hate Crime? HUH? BO Special Assistant Arrested??!! Who Will Watch the EPA? Zebras, Jack, Cecil -- "I'm Glad You're Dead!" Samaritan Shooter "Tired of Waiting Around"
People sometimes ask me "what have you been wrong about -- what things do you think you might be wrong about now". I went into a few of them here, but China is a bit in "another category". My theory is that command economies can't work -- the USSR, Cuba, North Korea, China prior to the '90s, etc. Even "more controlled" economies like Europe and the US that seemingly "keep going" with increasing government intervention, start to show signs of "stagflation", low employment, poor productivity, slower or non-existent growth rates, etc. But then there has been China. Since the '90s, growing like topsy always supposedly with more to come -- and even more important, with a population dedicated to doing the hard work to continue to make that happen! 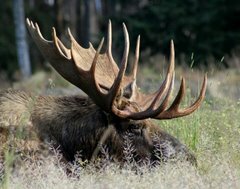 It has been enough to make a poor Moose wonder about his basic beliefs of economics! Now it looks like the ship of Beijing is at least in rough water, potentially upon the rocks. The moves reflect an economy increasingly failing to cooperate with Chinese leaders’ playbook to control the world’s No. 2 economy. The real world has a horrible (depending on perspective) tendency to fail to cooperate with various pronouncements from "supreme leaders", or even "huge landslide" votes. If it were not so, death, pain, poverty and a whole host of unpopular elements of reality would have been conjured away by some potentate or populist movement long ago! If the China economy meets a bad end (possibly taking the world for a scary downhill toboggan ride with it), my sense of how things work will be confirmed ... although with some pain in the net worth column! While "the world" no doubt is a long way from switching fully over to my view on the prospects for long term successful control of the economy by government, this paragraph indicates that they are are least having some second thoughts on the brilliance of the Chinese attempt at economic command and control. A key problem is that risk-averse banks continue to favor state-owned companies, eschewing private enterprises with less-traditional collateral and balance sheets. This often leaves entrepreneurs with higher growth potential to fall back on high-interest non-bank financing or go without. Meanwhile, many state-owned companies, already awash in cheap capital, are reluctant to borrow because of overcapacity in various industries. "risk-averse" -- general human nature is risk-averse. Thus insurance, votes for "security" provided by the the government, etc. "State-owned companies" are VERY risk averse -- as is the government, THEY CAN AFFORD TO BE! The "wildcard" is THE PROFIT MOTIVE! Keynes "animal spirits" -- the counterpose to "risk-averse", that if ignited, drives the economy forward. BUT, the government typically ends up dousing animal spirits and rewarding the risk-averse. It seeks to increase state actual ownership, or "de facto ownership" (as in medicine, education and other industries in the US), it seeks to increase regulation, it seeks to increase taxation -- all of which reduce the animal spirit (DRIVE) of the economy. It picks PAST winners and strangles potential future winners in the cradle. Eventually, "reality intrudes" -- it turns out that "the state" or "government" is not magic, all-powerful, etc, but rather just another competing organization that can suffer losses, lose the confidence of it's own people and other governments, and eventually, collapse -- the imaginary "security" that it so fervently promised is exposed as a chimera. USUALLY, reality intrudes at levels smaller than "collapse" -- stock market crashes, housing or land value collapses, "austerity", financial controls, "stimulus packages" -- but not always, sometimes it is bigger. A political party dies, a new form of government comes in, violence, etc. In my worldview, these things are inevitable, not surprising, and like "surgery now vs surgery later" can even have positive effects without killing the patient. It is like "pruning a tree", or "weeding the garden" -- expected and normal. To those that believe that government is something "beyond the world" however -- that it is capable of "conjuring spirits from the vasty deep" (to butcher Shakspeare), problems as we see in China create great anguish since ultimately they call the infallibility of man through government into question, and since that is the only faith they have, that is a crisis indeed! "There be Dragons" -- the unknown, out of our hands. If you are a "progressive", such shouldn't even exist -- because you believe that the world is "getting better" through more and more control exerted by man.